New York (Dec. 5, 2018) — At age 37, Anton Cannatella speaks of a former Youth Advocate Programs (YAP), Inc. participant as he would a younger brother, nephew or even son. The young man, now 18, is one of many youth Cannatella has worked with since 2013 in his role as a YAP mentor-advocate in the Bronx. “When I met him, he had just turned 16 and was referred to our program because of a robbery charge. His YAP enrollment ended almost a year ago and he hasn’t been in any trouble for 15 months. Now he’s immersed in an intensive auto mechanics training program. I’m proud of him,” Cannatella said. On the heels of the release of a report on the effectiveness of YAP’s community-based alternative youth incarceration model, Cannatella, his Bronx co-workers and fellow employees across the state stand ready to assist youth impacted by New York’s Raise-the-Age law. 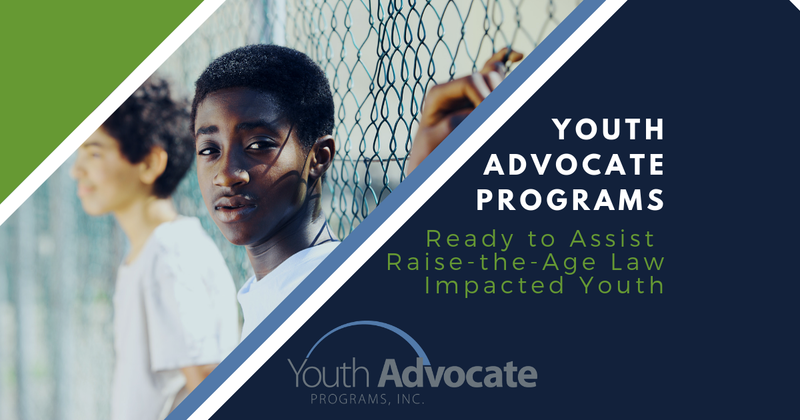 Operating programs throughout New York, YAP is responding to requests to serve Raise-the-Age law-impacted young people across the state with commitments in Clinton, Ontario, Seneca, Sullivan and Wayne counties and an anticipated partnership in St. Lawrence County. An evaluation released by New York City’s Mayor’s Office for Economic Opportunity (NYC Opportunity), found the state’s Advocate, Intervene, Mentor (AIM) program reduced justice-involved young people’s risk for recidivism, re-offending and out-of-home placement. YAP’s unique strength-based model is the prototype for AIM. Launched in 2013 by the New York City Department of Probation, AIM was implemented as part of the Young Men’s Initiative. AIM was court-mandated for justice-involved young people from all five Burroughs, ages 13–18 considered at high-risk for reoffending. The evaluation, conducted by the Urban Institute, found that more than 90 percent of AIM participants avoided felony re-arrest within a year of enrollment, far exceeding the 60 percent target. Excluding truancy and other non-criminal probation violations, more than two-thirds of youth studied avoided out-of-home placement. Fewer than 10 percent of AIM participants received a juvenile felony adjudication and only 3 percent were convicted of a felony in criminal court within a year of completing their AIM program. YAP, a nonprofit with a 43-year track record of successfully serving as an alternative to youth prison and out-of-home placements, serves nearly 19,000 youth and families in 100 communities in 22 states and the District of Columbia. In addition to its model being the program archetype, YAP was one of several nonprofits that implemented AIM during the evaluation period. YAP managed AIM in the Bronx, which represented 36 percent of the program participants evaluated. The AIM evaluation included 229 participants in the program between September 2016 and March 2017. Of those evaluated, 77 percent were male; 81 percent were African-American, and 16 percent were Hispanic. YAP hires advocates who live in the neighborhoods they serve who provide youth with intensive one-to-one mentoring. At the same time, YAP family advocates work closely with parents/guardians to design individualized toolkits that include connections to resources needed to help youth and their families succeed. At the center of the YAP model is helping people identify and tap into their gifts and talents to empower themselves to succeed in life and give back to others. In addition to counseling him “through drama and perilous situations in the streets,” Cannatella helped his YAP mentee transfer to a more appropriate school; assisted him with legal issues stemming from a charge related to defending a family member in a domestic matter; and recruited auto mechanics shops to hire the youth for two consecutive YAP supported-work internships. Two weeks before his time with YAP ended in Dec. 2018, the owner of the second mechanic shop where he had held an internship hired him as a full-time shop assistant. Cannatella said this served as recognition of his talent, affirming his desire to pursue a career as a mechanic while providing financial support needed for his training program. YAP has implemented its traditional community-based holistic Advocacy-mentor model for a pay-for-success pilot in Marion County, Indiana. In the first 18 months of the 24-month program, the YAP model proved to reduce the number of residential program bed days, save dollars and keep youth and communities safe. Serving moderate to high-risk youth who would have otherwise been incarcerated, the program’s 18-month results included 72 percent of those served remaining in their communities. The program reduced bed days by 6,893 — double the projected 3,298 saved days, representing a savings of $1.6 million, also more than double projected cost savings. YAP’s outcomes with young people who commit nonviolent and violent offenses is also consistent with data reported by the Research and Evaluation Center at John Jay College finding community-based alternatives are less costly and more effective at rehabilitation and lowering recidivism. The Research and Evaluation Center at John Jay College looked at 1,851 YAP youth who were in the juvenile justice system for misdemeanors, status offenses and felonies. The use of secure confinement for youth decreased, regardless of the severity of the offense. Six to twelve months after discharge from YAP, only 5 percent were living in secure facilities. In Chicago, the YAP model has been adapted for a crime prevention program serving youth who have already had contact with the justice system or are at high-risk, as determined by residential zip codes, exposure to trauma, gang affiliation and/or high absenteeism from school. Choose to Change, a partnership between YAP, Children’s Home & Aid and the University of Chicago Crime Lab found that after 18 months, violent crime among participants had been cut in half; and most participants who had previously dropped out of school are attending school again.